At a distance of nearly 1000 light years, the apparent size of this nebula is pretty large — it covers nearly 2.5 degrees of sky. If you’ll recall the the moon diameter is about half a degree, this this monster is five moon widths. As with other “apparently big” objects, you’re going to want to use a short focal length and a low power to have any chance of seeing it. This image was captured on November 4, 2010 with the Televue NP101is and Orion Starshoot Pro v2.0 with Skyglow imaging filter. 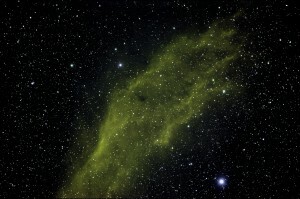 15x 300s images were captured in MaximDL, and then processed in Nebulosity. The high-res image here is pretty incredible, again a testament to the awesomeness of the NP101is and the CGEM. Even though the nebula is not well framed (the subs didn’t give a good feel for where it would show up), I was really happy to be able to get some of the filaments to appear. 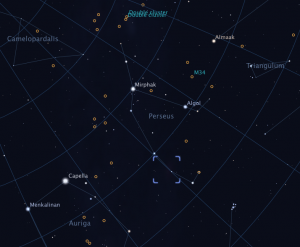 However, Perseus is appearing high in the sky and if I get another clear night I might be able to get a mosaic together to fix the bottom! The bright star you see there is Menkib, a good star to use for locating this nebula. However, it will be difficult to see with any light pollution, so unless you are doing some long exposure photography, you’ll need dark skies or an H-Beta filter to see it. If you’re able to catch a glimpse, or even image it yourself, I’m always looking for good tips, so please feel free to comment it up! This entry was posted by admin on November 9, 2010 at 12:29 am, and is filed under Nebulas. Follow any responses to this post through RSS 2.0.You can skip to the end and leave a response. Pinging is currently not allowed.